Try our three dozen, bite-size, mini layer cakes dipped in chocolate and decorated by hand. 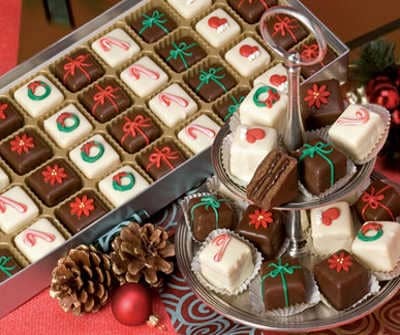 Petits fours are a great alternative to plain chocolate and look enticing all dressed up for the holidays. Our Demitasse Petits Fours are dressed up for the holidays. This lovely gift box contains 36 luscious bite-size miniature layer cakes dipped in dark and white chocolate and beautifully hand-decorated with festive holiday motifs. Unwrap petits fours with Candy Canes, Poinsettias, Woolly Mittens, Wreaths, English Holly and Gift Packages tied with colorful chocolate bows and strings. Varieties of petits fours included in this assortment are: Raspberry and Vanilla Creme, Bittersweet Truffle, Orange Creme, Chocolate Mint and Strawberry Creme. Did you know there are three types of petit fours? Sec (dry) - plain tiny cakes like puff pastry. Glacé - decorated with fondant or icing. Salé (salted) - savory petit fours served as appetizers. How do you pronounce "petit fours"? Actually, it's "petits fours", in the proper French plural form, not "petit fours". The last two letters in "petits" and the last letter in "fours" are silent, making the term sound like "petty" as in Tom, and "four" as in the number 4. A single miniature gourmet dessert would be written "petit four" - but you'll only ever hear the plural used with these delicious little bakery treats. It's too hard to eat just one.